The Perfect Greenhouse for Growing Orchids, Houseplants and Garden Plants. A true glass greenhouse for your personal gardening enjoyment. Our Arcadia residential greenhouses are designed for gardening enthusiasts who want the performance and beauty of a glasshouse, without the requirements of an expensive concrete foundation. These units are built with our strongest extruded aluminum frame and a unique h-channel glazing system that far exceeds the strength of any other greenhouse in its class. This is an affordable garden greenhouse that offers the best quality in its class. Everything about the Arcadia GlassHouse is built for quality, from the 1-1/4” extruded aluminum square tube frame, to the 3/16” glass, which is 50% thicker and stronger than other greenhouses. Our glass is not held in place with metal clips and there are no overlapping panels. Each Arcadia glass panel is framed with our exclusive anodized aluminum h-channel and an EPDM rubber seal that insulates and protects the glass. Build your home greenhouse with or without kneewalls, freestanding or as a lean-to greenhouse – it’s up to you! These are not snap together greenhouses, like other hobby greenhouse kits; ours includes a welded aluminum frame with commercial quality construction. These Arcadia glasshouses can be built on 4 x 6 treated posts anchored to the ground in any well drained site, or they look stunning on a 32 inch kneewall, as shown. The optional kneewall can be built with brick, stone, glass block, or popular retaining wall blocks, which lock together without mortar. Victorian style greenhouse accessories are also available, including cresting and finials. Both even-span and lean-to greenhouses are easy to assemble with pre-drilled, bolt-together materials. Fact: In England, where 15% of all residences have a greenhouse on their property, 90% of those are glasshouses. Arcadia glass and polycarbonate greenhouses are designed to create the perfect growing environment. The biggest challenge for any hobby greenhouse is keeping it cool in the summer and warm in the winter. That’s why our Arcadia GlassHouses are designed with glass or clear polycarbonate sidewalls for optimum light penetration and double-wall or triple-wall polycarbonate roofs for maximum insulating value in summer and winter. Heat rises and tries to escape out the highest point. It makes good sense to put your best insulating material in the roof and we’ve selected a high-quality 8mm or 16mm polycarbonate material with built-in shading to protect your greenhouse from overheating where direct sunlight can burn plants. The polycarbonate roofing material in these quality greenhouse kits protects your plants with two glazing options to match your growing conditions perfectly. Polycarbonate reflects the damaging ultraviolet (UV) lights waves, while allowing the photo-synthetically active rays (PAR) to come through, providing your plants with the spectrum of light they need to thrive. Choose from two glazing options for your roof based on your own conditions. We recommend our standard 8mm bronze polycarbonate for most conditions and our new 16mm polycarbonate for cold winter conditions. 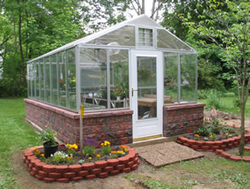 Both options are available in lean-to greenhouses and even span greenhouse models. • Clear Polycarbonate provides 80% light transmission and 20% shade. • Bronze Polycarbonate provides 60% light transmission and 40% shade. Arcadia GlassHouses are available with 3/16” glass or 8mm triple-wall polycarbonate side walls.